New York, NY – September 7, 2016 – Lime Brokerage (Lime), a Wedbush Company, and Vela, a global leader in high performance trading and market data technology, are pleased to announce the integration of Lime’s Strategy Studio, its software solution for streamlined strategy research and deployment, and Vela's market leading low latency direct feed handlers. 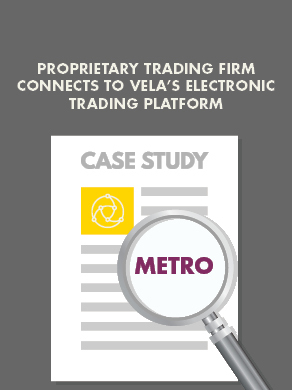 Both companies share a commitment to high performance trading technology, and the combined products enable clients to benefit from Strategy Studio's rich strategy API and strategy management interface, while accessing Vela's broad and highly configurable set of over 250 global direct feeds supporting all major asset classes. Lime’s Strategy Studio facilitates single stream strategy development, allowing clients to use a consistent code base for back testing, simulating from live market data, and trading in production. With real time performance tracking and rich state management for market data and order placement, the product helps trading firms focus their development efforts on just the logic of their strategies. Vela delivers a software-based direct feed handler solution enabling flexible, low-latency direct access to market data feeds through a single API. Vela provides fast, normalized market data, including level 1 and full depth of book as applicable, covering a range of market data feeds, across multiple asset classes in multiple regions, including equities, foreign exchange, fixed income, commodities and derivatives instruments. The normalized data includes trades, security status, product information, imbalance, and market orders in auctions. "We are happy to be working closely with Vela on supporting the integrated products. With Vela's comprehensive coverage, flexible deployment options, and high level of configurability, we are able to minimize redundant market data handling between our products, creating a highly-performant solution with global flexibility," says David Don, Head of Quantitative, Execution and Risk Products, at Lime. Vela and Lime are also working on integrating Strategy Studio with Vela's market gateway libraries. With this in place, clients will have a fully in-process end-to-end tick-to-trade technology stack with broad market support. Lime Brokerage (“Lime”) offers the industry’s most advanced trading technologies and execution services, providing systematic traders superior access to the most automated, high-volume electronic trading markets. Lime’s systems provide unsurpassed reliability and scale with exceptionally low latency. Developed to handle the demands of the automated and electronic trading community, Lime’s technology caters to a diverse and sophisticated client base. The result is a robust, highly reliable, agency-only system that includes market data and trading platforms. It allows clients to trade efficiently and anonymously across all major lit and dark market venues. WEDBUSH, Inc. is a leading financial services and investment firm that, through its holdings, provides private and institutional brokerage, investment banking, equity research, fixed income, clearing, sponsored-access and execution, private capital, commercial banking, and asset management, to individual, institutional, and issuing clients. Founded in 1955, the firm's largest holding, Wedbush Securities, is one of the largest full-service investment banking and brokerage firms headquartered in the western United States, with nearly 100 offices nationwide. WEDBUSH is devoted to delivering its clients dedicated service, financial safety, continuity, and advanced technology. WEDBUSH, Inc. includes affiliated firms Wedbush Securities, Wedbush Asset Management, Wedbush Capital Partners, Wedbush Opportunity Partners, and Lime Brokerage LLC.